Prefa - thanoscardgamess jimdo page! 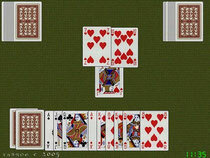 Prefa is a Greek game for three players loosely related to the Russian Preference. In each hand, one player (the declarer) chooses the trump suit and tries to make at least six of the ten possible tricks. The other two (the defenders) try to prevent the declarer from winning, but also have an objective to make two tricks each. At the beginning of each hand there is an auction to decide who will be declarer. Various options and Greek card decks are available to play with. Prefa is the game of the Russian Preference family as played in Greece. absence of any 'misere' contract. first defender may invite the second defender, if he had passed before and the second defender selected to go alone. the talon is never revealed to players apart to the declarer. different (somewhat complex) scoring system and contract values. The player who bids first, will also play first, after the bidding phase (i.e. independently to who will become the declarer). The high bidder wins if he succeeds to make at least the bidded tricks. He loses if he makes less than the bidded tricks. The other players (defenders) try to make as much tricks as they can (individually or in total). Standard deck of 32 cards, including 7 (lower),8,9,10,J,Q,K,A (higher) in each suit. The game is played anticlockwise. The dealer deals 2 cards to each player, and then 2 in the table to form the talon. Then, the rest 32 cards are dealt to each player, 2 by 2. In the first game, the player who has the 7 Diamonds bids first. (According to reference  -see at the end of this text-, if this is in talon, then the player who has the 8 Diamonds deals first). If the 7 Diamonds (or both 7 and 8 Diamonds according to ) are in talon, then the cards are resuffled and dealt again. In the second and the other games, first speaks the person sitting in right of the previous speaker (the next person in an anticlockwise direction). The player who speaks first, will also play first, after the bidding phase (i.e. independently to who will become the declarer). After the deal, the bidding starts. If a player bids something of the above this means that he has to get at least 6 tricks. A player who thinks he cannot make at least 6 tricks, or his bid is overcome, he may pass. Players who pass may not re-enter the bidding process. Note that there is not any named 'misere' contract as in other (e.g. Russian) Preference games, neither players play 'misere' games (trying to avoid getting tricks). Instead, if all players pass, the cards are suffled and dealt again by the next player in turn. This can happen very often, since the penalty for a contract that is not fullfilled is very high. Suppose the player A believes he can make 7 tricks with spades as a trump suit (and speaks first), player B believes he can make 6 tricks with hearts trumps and player C believes he can makes 7 tricks with clubs trumps. The following presents the bidding procedure. As long as two players pass, the bidding ends. knowledge during play against the declarer. The higher bidder gets the 2 talon cards, and discards face down 2 cards. In no case are the talon cards revealed to any player apart to the high bidder / declarer (opposite to other -mainly Russian- Preference variants).The other two players have a chance to abandon, and if they select to play, then they play against the declarer. If a player decides to play, and the declarer has bid 6 tricks, the player must do 2 tricks at least. If one of the players decides to abandon the hand, the remaining player may invite him against the high bidder in a try to capture 4 tricks, or play alone. If he selects to invite the other player, the latter plays on behalf of the other defender (i.e. any scoring who achieves the invited player, counts for the player who invited him). If a player decides to go alone he has to achieve f.ex. 2 tricks (if the bid was of 6 or 7 tricks), hence the task of the declarer is easier (he still has to make at least the bidded tricks). If the first defender has dropped out, and the second defender selects to play alone, the first defender gets another chance of playing by inviting the second defender. If the first defender selects to invite the second defender, then the second defender plays on behalf of the first defender (just like if he had initially passed and then invited by the first defender). This rule is unique to Prefa in contrast to Russian (or other) Preference games. However, there is a reference that omits this privilege of the first defender . In brief, minimum tricks for each defender is 2 tricks if the declarer has bid up to 7 tricks, and 1 trick if the declarer has bid 8,9 tricks (doubled if one defender quits and the other selects not to invite him). Optionally, 1 trick may be needed for a 10 tricks contract as well (if agreed before the game among the players). There are different values depending the contract. If the declarer has all the aces in hand, he may announce this right after declaring the contract and raise the bid. Typically, in this case, the value of a contract is raised in chips that equal the number of the kassa points every player has put initially in the pot. Hence, if the initial kassa was 20, the contract will be raised by 20 chips. Other values can be agreed as well (see the 'Scoring' section that follows, for explanation about the Kassa and Chips points). The player who plays first (this means that this player is not -necessarily- the declarer, but the player who spoke first), leads any card. The other players must play a card of that suit, or, in the absence of that suit, they must play a trump, or, in absence of trumps they may play any other card. The winner of the trick is the player who played the highest trump, or the highest card of the suit led in the absence of trumps. If the led card is trumped, and the last player is void in the suit led and he may overtrump, then undertrumping is not allowed. If he cannot overtrump and he is still void on the suit led, again he has to play a trump (if he has any), thus undertrumping. There is not any other obligation to beat a previously played card (i.e. in a case that a card is not trumped). The winner of the trick leads next trick. Since the declarer does not plays first (necessarily), special care must be taken during the bidding phase, considering the turn a player has during the first trick. For example, declaring a 6 No Trumps contract may be a risky decision in case the declarer does not play first. In Prefa there are two counting units: Points (a.k.a 'Kassa' points) and Chips (a.k.a 'kapikia'). Before starting the game, each player puts money in the pot representing the kassa points (hence if the kassa is agreed to have a value of 20, and 1 point of Kassa is agreed to represent 10 cents, each player puts 2 euros). 1 chip equals to 1/10 of a kassa point (e.g. 145 chips at the end of a game can represent 1.45 euros, if 1 point of Kassa is agreed to represent 10 cents - as above). 1. The bidder subtracts from his score the number of tricks declared. His opponents get chips from the bidder the tricks gained by each one, multiplied by the value of the bidding (e.g. 2 for the 6 spades,3 for the 6 clubs, 8 for the 7 No trumps etc.). 2. The bidder adds to his score the value of the contract declared. His opponents get chips from the bidder the tricks gained multiplied by the value of the contract. 3. The bidder adds to his score the double value of the contract declared. His opponents get chips from the bidder the tricks gained multiplied by the value of the bidding and doubled. 4. This situation means that one of the players has got one less trick. This player pays to the other players: to the bidder, chips equal to the tricks gained by the bidder multiplied by the value of the bidding; to the other defender, chips equal to the tricks gained by the defender multiplied by the value of the bidding. 5. If one of the players has got two less tricks: This player pays to the other players: to the bidder, chips equal to the tricks gained by the bidder multiplied by the value of the bidding and doubled; to the other defender, chips equal to the tricks gained by the defender multiplied by the value of the bidding and doubled. If each of the defending players has got one less trick than needed, each of them pays to the bidder chips equal to the tricks gained by the bidder multiplied by the value of the bidding. Assume that Player A is sitting next to bidder (in an anticlockwise direction). Additionally, special scoring conditions apply in the case of a bid of 9 in every suit (the position of each defender, as related to declarer, is critical to determine the required tricks), and also in the bid of 7 in every suit. Note that the only case the Declarer subtacts from his score (kassa) the number of tricks declared, is when he makes exactly those tricks. You may observe as well that the penalty for not completing the contract is very high for the bidder. He has to increase the kassa and to pay chips to the defenders. Note also that in the case the Declarer makes more tricks than bidded, although he does not reduce his kassa, his financial income in chips is higher (equivalent to the additional tricks he scored). If a declarer exist and both other players pass, the Declarer subtracts from his score the number of tricks declared, and there is not any other (chip-based) dealing. The invited player neither earns nor loses any score or chips. If one player makes his score equal to zero (zero kassa) then he gets any earning in chips. When all players make zero kassa, the game ends and each player gets the chips earned (or pays to other players if he is losing).
. Evangelos Leivaditis,"The alphabet of Prefa", Editions Diavlos, 2001 (in Greek).
. George Kousounelos, "The alphabet of the cardplayer", Editions Diavlos, 1998 (in Greek).